The British Security Service (MI5) needed to jump through several bureaucratic hoops in order to have German spy Josef Jakobs tried by court martial. Their application for a court martial first landed on the desk of the the Director of Public Prosecutions who, after reviewing it, sent it on to the Attorney General on June 24. According to the Treachery Act, the Attorney General's fiat or approval was required to try someone by court martial. The Director of Public Prosecutions, Edward Hale Tindal Atkinson, had consulted with Parliamentary draftsmen and knew that it was the Attorney General's intention to limit the use of his power by only accepting court martial applications for enemy aliens who were in the military service of their country. Of all the cases before them, MI5 knew that Josef's case had the best chance of being approved for court martial - an enemy alien who was in military service to Germany. In the Matter of the Treachery Act, 1940. In the Matter of Josef Jakobs. shall be prosecuted before a Court Martial. 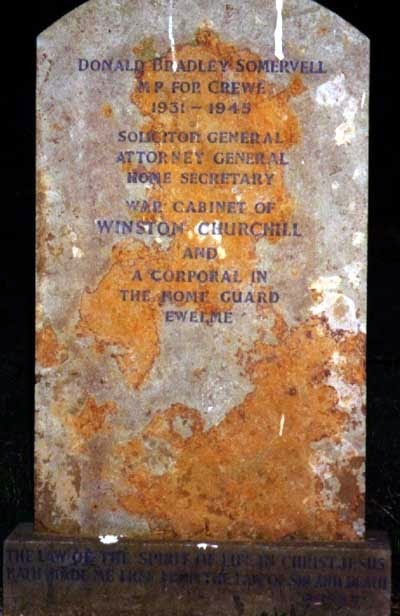 The Attorney General dealt with many crises during his career, including the abdication of King Edward VIII. Dealing with the court martial of a German spy would have been a minor event in Somervell's life. Donald Bradley Somervell was born on 24 August 1889, to Robert Somervell and Octavia Paulina Churchill. Donald's father was Master and Bursar of Harrow School in north-west London, a most prestigious academy whose alumni would eventually include seven prime ministers (including Winston Churchill) and several foreign monarchs. Donald naturally studied at Harrow before moving on to Magdalen College, Oxford where he graduated with first-class honours in Chemistry. After studying at Oxford, Donald joined the Inner Temple to study law but his training was interrupted by World War I. He served in India (1914-1917) and Mesopotamia (1917-1919). He was called to the Bar (in absentia) in 1916 and after the war became involved with commercial clauses in the peace negotiations. In 1929, Donald was invested as Queen's Council and also became interested in politics, joining the Conservative Party. He won a seat at Crewe in the 1931 election, a post he would hold for the next 14 years. The year 1933 was a busy one for Donald. In June, he married Loelia Helen Buchan-Hepburn, daughter of Sir Archibald Buchan-Hepburn of Smeaton Hepburn, 4th Bt. In addition to this auspicious wedding, Donald was appointed Solicitor General and knighted. In 1936 he was promoted to Attorney General. He served as Attorney General for nine years and oversaw such crises as the abdication of King Edward VIII. National Archives, Security Service files on Josef Jakobs, KV 2/27. Wikipedia article on Donald Somervell (accessed December 30, 2014). Laybourn, Keith. 2001. British Political Leaders - A Biographical Dictionary, ABC-CLIO, Inc. Santa Barbara CA. Section on Donald Somervell, p. 300. The Peerage website (accessed December 30, 2014).